Automotive law firm Hagens Berman has filed a class-action lawsuit against Ram Trucks parent company Fiat Chrysler and its diesel engine supplier Cummins, alleging that the companies collaborated to fraudulently under-report how much pollution heavy-duty pickup trucks were producing. Ram 2500 and 3500 pickup trucks have run Cummins engines for decades. 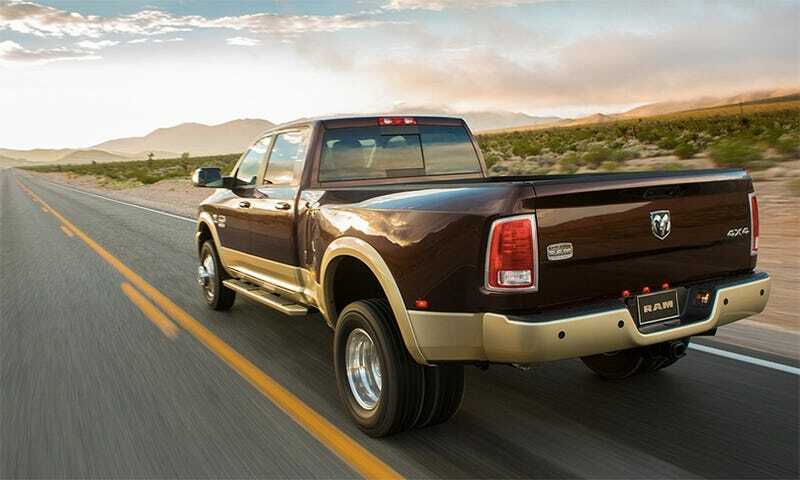 In fact, the collaboration between these companies is often credited with raising Ram to relevance in the truck scene at the end of the 1980's. Hagens Berman goes on to detail that legal limit for NOx emissions, the poisonous nitrogen oxides emitted by combustion engines, is 200 mg/mile “for stop and go driving.” In a press release, the firm claims Cummins-powered Ram 2500 trucks emitted 702 mg/mile under such conditions “on average, and 2,826 mg/mile at maximum emissions.” Similar results were apparently recorded under highway conditions, and neither prompted any engine fault codes that might indicate incorrect operation. These trucks are supposed to have a catalyst system in their exhaust systems that curtails noxious emissions, but Hagens Berman alleges that the process is inadequate, and in fact prone to failure at the cost to consumers of between $3,000 and $5,000. The Cummins trucks were supposed to be way ahead of the curve on meeting emissions requirements. So much so that the companies were able to create “carbon credits.” These are basically compliance-vouchers doled out by the EPA, and if your corporation is able to get below the emissions requirement in one area or product, it can add more headroom to the limit some place else. As you probably worked out from the strong word choice in Berman’s statement, Hagens Berman thinks the companies came up short and is seeking restitution for every 2007–present Cummins Ram owner with today’s class action suit: Bledsoe v. FCA USA LLC, 16-cv-14024, U.S. District Court, Eastern District of Michigan (Detroit). How Will Volkswagen&apos;s Board Vote To Overhaul The Company?